Following the recent double gold medal success at ISAF Sailing World Cup Palma the NZL SailingTeam are now less than a week away from the start of racing at the next ISAF World Cup Regatta in Hyeres, France. 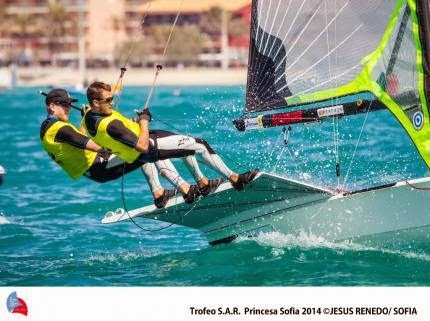 ISAF Sailing World Cup Hyeres, on the French Riviera, is the final event in 2013-2014 series which has included regattas in China, Australia, USA and Spain, and will conclude in France next week. A full contingent of the NZL Sailing Team are entered and will again come up against large, full strength fleets featuring their rivals in Olympic class sailing from around the globe. Organisers are expecting over 1000 sailors from 60 nations to compete, and the regatta provides another chance for the kiwiteam to see how they stack up after the New Zealand domestic season. Following the recent gold and two bronze medals at the ISAF Sailing World Cup Palma, the Australian Sailing Team are now a few days away from the start of racing at the next ISAF World Cup Regatta in Hyères, France. Over 1,100 athletes have registered to sail in Hyères next week, including a near-full contingent of the Australian Sailing Team and Squad. Hyères will also be the first time this year that 49er Olympic Champions Nathan Outteridge (NSW) and Iain Jensen (NSW) will return to the European racing circuit in Olympic class sailing. The duo, who have re-signed for another America’s Cup campaign with Swedish Artemis and last won the Olympic 49er event at the Sailing World Cup in Melbourne in December, have prepared together with the Australian Sailing 49er squad on home waters at Lake Macquarie. “We couldn’t make it to Palma this year, but we made the best of the good weather in Australia and had a strong squad of four boats training together on Lake Macquarie to get ready for Europe. We’re looking forward to racing in Hyères and see where we are at,” Nathan Outteridge added. Australia’s 470 Women’s crews including Sarah Cook (VIC/ACT) and Carrie Smith (WA) plus Australian Sailing Squad combinations Sasha and Jaime Ryan (QLD) and Jacquie Gurr (VIC) and Amelia Catt (TAS), will be kick-starting their 2014 European campaign in France. While the 49er and 470 women will start their 2014 European campaign in Hyères, for 470M crew Mat Belcher (QLD) and Will Ryan (QLD) as well as for Nina Curtis (NSW) and Darren Bundock (NSW) in the Nacra 17, the aim will be to build on the results from ISAF Sailing World Cup Mallorca a couple weeks ago. Both crews finished third in Palma and are now aiming to progress in Hyères. Expectations are also high in the Laser fleet after Australian Sailing finished strongly in Palma with Tom Burton (NSW), Mathew Wearn (WA) and Ashley Brunning (NSW) in the top ten overall and competing in the medal race. Since Palma the team had some time out of the boat, mostly doing some cross training and a bit of downtime to refresh and prepare for the next event. With the Hyères event cap being extended from 120 boats to 130 boats in the Laser, Australian Sailing Squad members Luke Elliot (WA) and Jeremy O’Connell (VIC) were granted late entries on Tuesday, ending a period of significant angst when it seemed they would be forced to watch from shore. Hyères will also see Paralympians Colin Harrison (WA), Russel Boaden (WA) and Jonathan Harris (NSW) take to the waters on their way to the IFDS World Championship later this year. ISAF Sailing World Cup Hyères brings together the world's top Olympic and Paralympic class competitors campaigning for the Rio 2016 and Paralympic Sailing Competitions. 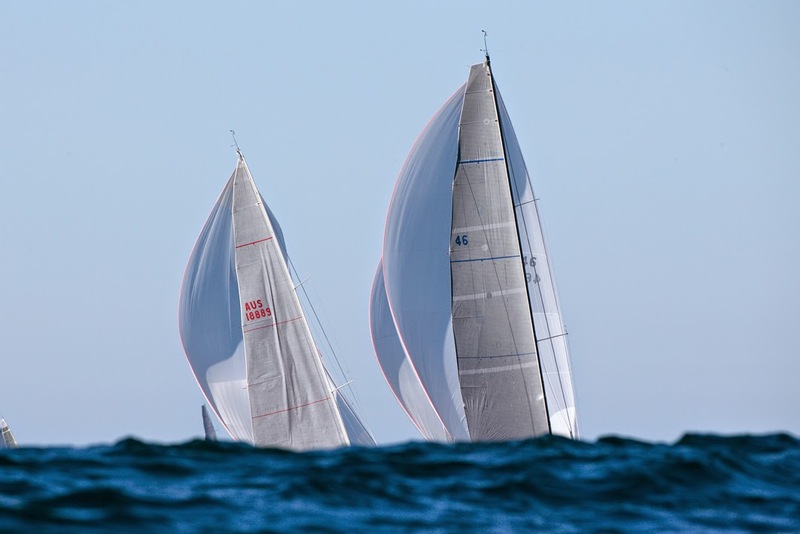 The ISAF Sailing World Cup Hyères from 19-26 April will be the last World Cup of the 2013-14 as the series draws to a close. Racing commences on Monday, 21 April across ten Olympic and two Paralympic events. The Medal Races on Saturday 26 April will bring the regatta to a close. 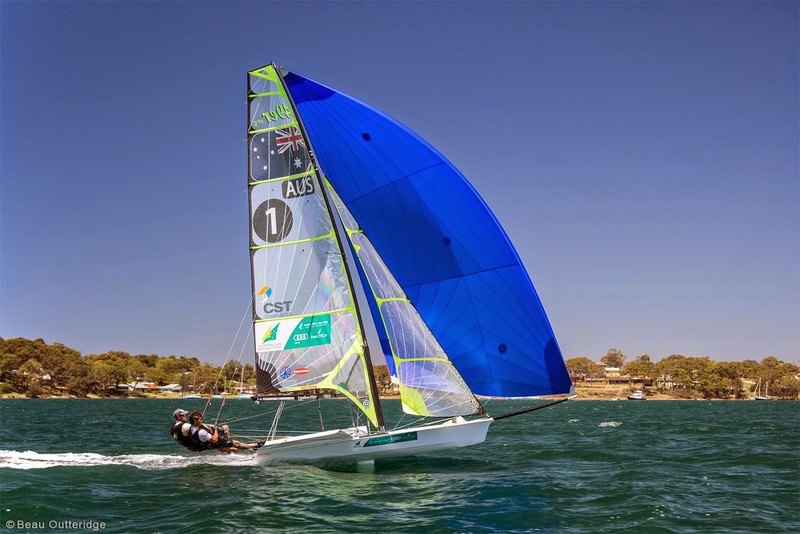 Hyères will see a full contingent of the Australian Sailing Team race in the Olympic boat classes before crews continue onto individual events such as EUROSAF regattas as well as European Class Championships. The full team will then head to the ISAF Sailing World Championships to be held in Santander in September, an event to decide half of the nation slots for the Rio 2016 Olympic Games. 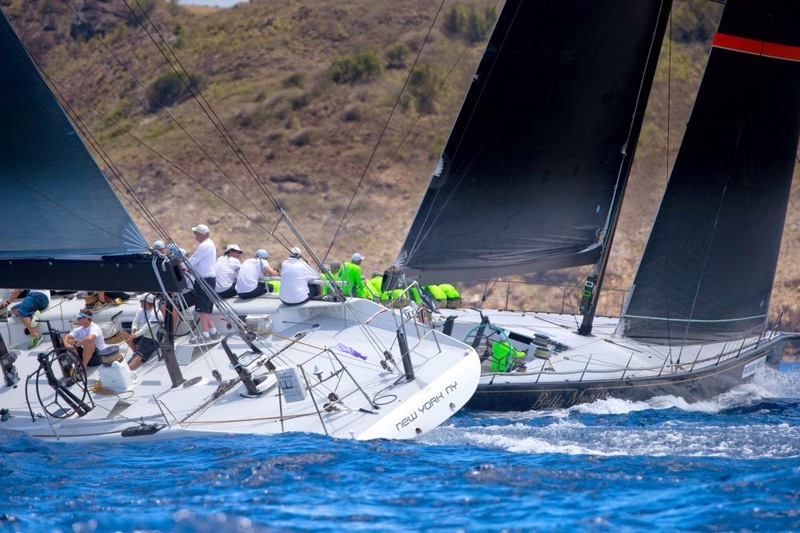 The Weather Gods had promised more breeze for Day 2 of Les Voiles de St. Barth, and it came in a steady line of squalls moving south to north across the island, presenting challenging conditions for competitors and the Race Committee alike. After a general recall, the Maxi and Spinnaker Zero classes took off on a 17 nautical mile course along the southern coast of St. Barth, only to disappear into a driving rain and building breeze halfway up the first beat as they got raked by the first squall. With visibility on the start line greatly diminished, the Race Committee held off for about 40 minutes, and then with persistence and a weather break before the next approaching squall, they managed to send off Spinnaker 1-2-3 and Melges 24 classes on the same course as the Maxis. Spinnaker 4, Non-Spinnaker, and Multihull classes were next, racing on a 26 nm course out along the southern coast before doubling back and wrapping around the island’s north coast for an additional long beat and then a run back to the finish. Given that the bigger, faster boats in the Maxi and Spinnaker Zero classes were able to cover distances quickly on the coastal courses’ long reaching and downwind legs, the Race Committee ran a second race for these classes, sending them again on the same 17 nm course. And the Leaders are… Racing is extremely close, and after two days (and two or three races in each class), the top two boats in all classes, save Non-Spinnaker, are separated by no more than two points. Hap Fauth’s Bella Mente (Minneapolis, Minn.), managed two wins today to lead the Maxi class, with Caol Ila R (SUI) finishing second. In Spinnaker Zero, Near Miss (SUI) andBalearia (ESP) posted finish positions of 2-1, and 1-2, respectively, allowing the Swiss boat to lead now by one point. In Spinnaker 2, Steve Cucchiaro’s (Boston, Mass.) 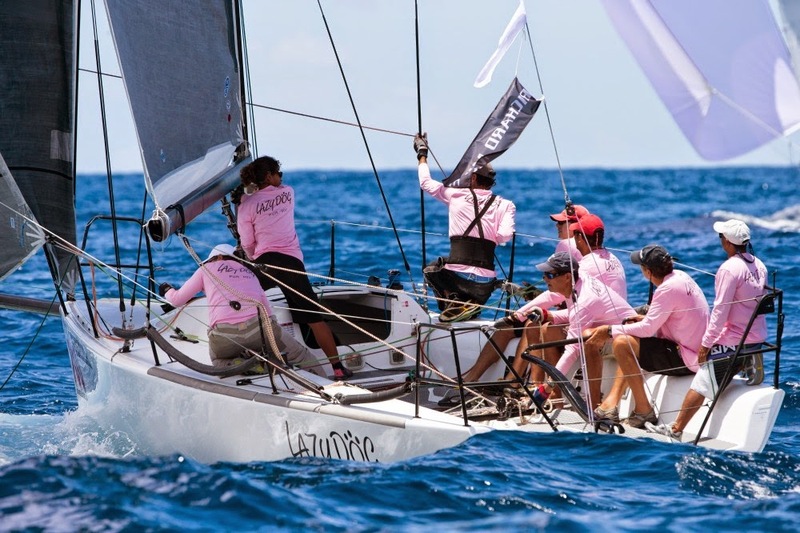 chartered Swan 56 White Rhino is tied on points with the Swan 48 Affinity, but leads on countback. Drag Racing in Spinnaker 1The five-boat Spinnaker 1 class has great depth of talent, and includes Peter Harrison’sJolt 2 (GBR) with Volvo veteran Campbell Field at the wheel; past Les Voiles class winnerLazy Dog, a Melges 32, with Puerto Rico’s Sergio Sagramoso steering; and Stark Raving Mad IV (Newport Beach, Calif.), a J/125 with Tony Rey, past America’s Cup sailor and Olympic coach, serving as tactician. Festivities AshoreTonight is the gala soiree and auction to benefit The Brain and Spine Institute - ICM at the Eden Rock on Baie St. Jean. Guests of honor are Bruno Magras, President of the Collectivitie of St. Barthelemy; Michel Magras, Senator of St. Barthelemy; and Professor Gerard Saillant, Chairman of ICM. Also tonight is the Crew Party on Shell Beach, with live entertainment and fireworks. Tomorrow, Thursday, is the traditional lay day on Baie Saint Jean, where competitors will enjoy lunch at Nikki Beach as well as festivities that will include stand-up paddleboard racing. “We have a great crew, pretty much the same as we had on Defiance last year. Steve Cucchiaro is the charterer, and this year we have Cam Lewis and myself, Mark Laura, Jack Slattery, Stu Johnstone, and a cast of lots of other good people…but plenty of people on the back of the boat to decide which way to go! This is Harrison’s second time at Les Voiles de St. Barth, and this year he has a very experienced crew including Campbell Field, an accomplished offshore and grand-prix navigator and tactician. John Cutler, strategist on Bella Mente“It was a really interesting and great day of sailing. Conditions were really shifty and influenced by waves and quite a lot of rain in the first race. That moved the breeze around about 20 to 30 degrees, and at the same time we were going around different points so there was a big shift there. Overall it was a complicated day and we kept just looking forward and waiting for the next shift to come our way. Racing continues on Friday and Saturday (10 a.m. start) for the nine classes: Maxi, Spinnaker 0-1-2-3-4, Melges 24, Non-Spinnaker, and Racing Multihull. For a bunch of diehard yachties Good Friday was spent out on the brilliant deep blue ocean off Newcastle contesting day two of the Audi IRC Australian Championship. Race four of the championship started at 0930hrs off Nobbys Beach, a 50 nautical miler for the big boys in division A and a huge 28 nautical mile triangle long distance race for divisions B and C in 10-12 knot WNW winds that turned SE then every which way and lightened off, and a more forgiving swell. Yesterday’s gruelling three short courses in lumpy seas required balance and stamina, and was wearing on the body and gear. In that type of seaway boats wobble and kites burst. In all his years of sailing around the world Ichi Ban helmsman’s Gordon Maguire had never seen a wave punch a hole in a spinnaker – until yesterday. Today’s division B finish was a nail-biter, Exile, Nine Dragons, Anger Management and Elena Nova all crossing within a minute and a half after a four hour race. The two DK46s have traded places and now Bob Cox’s Nine Dragons conventional DK design leads the pointscore at the half way point. Cox, who first came to sailing in his early 60s, owns a lovely old Chinese carving of nine dragons interwoven with calligraphy that says ‘Nine dragons are invincible’. Dragon insignia adorns the boat and crew shirts and invincible is how they appear on the scoresheet this afternoon. Rob Reynolds’ Exile is a highly developed DK with a new shorter mast and square top mainsail. Their win in last month’s Sydney Harbour Regatta made the Nine Dragons crew revisit their program and decide to race this weekend with two tacticians, regular Mitch White and Will McKenzie on back up. “My brain’s fried,” commented White on today’s 40 degree wind shifts and breeze dropping out to 4 knots that made the closing stages so draining. In Division C it’s the battle of the 40-foot Beneteaus. Justadash and Schouten Passage finished the 28nm race first and second on corrected time this afternoon and the same pair now lead the progressive pointscore. Phil Dash’s Middle Harbour Yacht Club based Justadash has a three point buffer over Ron and Jan Howard’s local boat, Schouten Passage. Lake Macquarie based RP36 Spirit campaigned by Ian Bower rounds off the top tier. “We are enjoying the tussle with the local boys,” said Dash this afternoon. 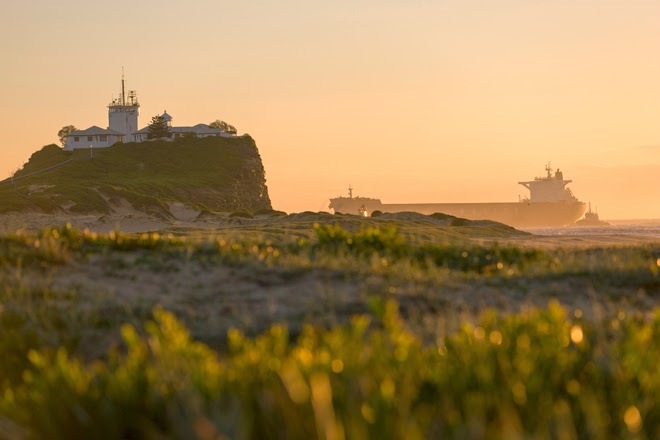 He also commended Newcastle Cruising Yacht Club for its hospitality and Denis Thompson’s race management team for setting fair courses in changeable winds. 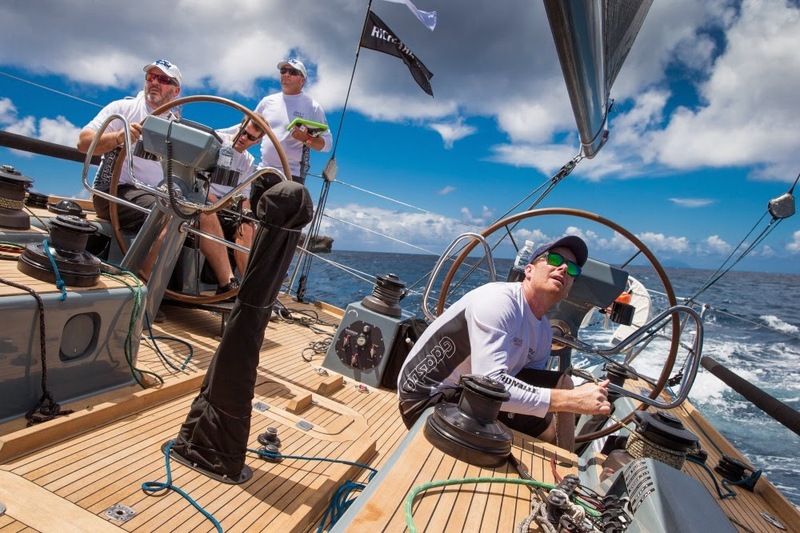 Matt Allen’s Carkeek 60 Ichi Ban, the largest in the fleet, and its bevy of high profile names finished first over the line after seven or so hours at sea, the drivers and tactician Tom Slingsby dog-tired after a long day concentrating in the sun. Karl Kwok’s Team Beau Geste was second. Ichi Ban’s hydraulics are back to working order thanks to the mechanics who repaired yesterday’s glitch, but the player’s player award goes to North Sails’ Richie Allanson who drove back to the Sydney loft last night, worked until midnight to rebuild the owner’s torn spinnaker and presented back at the boat early this morning at Newcastle to re-join the crew as trimmer. Division A handicap results will be available later this evening here. The last boat in division A, currently Celestial, has until 7.30pm to complete the course within the 10 hour time limit. Their current ETA is 6.30pm. Good news for local followers was Mick Martin’s older generation TP52 Frantic representing the championship host, NCYC, returning to the track having sorted out a right old pickle involving a spinnaker snarl. Tomorrow’s format is one short course and a medium distance race and Sunday’s final two sprints will deliver Easter goodies to the three new IRC champions in the form of trophies and a brand new North Sails spinnaker emblazoned with ‘2014 Audi IRC Australian Champion’. 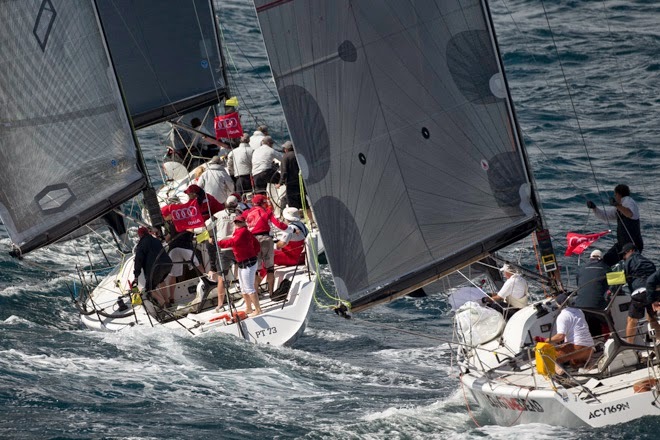 The closest the 31 crews contesting the Audi IRC Australian Championship went to a traditional Easter lunch celebration involving seafood was seeing frolicking dolphins on a stunning but drawn-out autumn afternoon. Tonight’s Good Friday Fish Fry at the NCYC will mark the traditional seafood feast instead. Syd Fischer’s 90-ft Maxi Ragamuffin has a commanding lead some 42 hours into the 27th edition of the Rolex China Sea Race. At 09:30 local time, Fischer’s Ragamuffin 90 was 134-nm from the finish line in Subic Bay, The Philippines and closing in on line honours. Ragamuffin 90 has averaged a steady 10 knots since the start of the race, steadily increasing her lead over the chasing pack. She is expected to complete the 565-nm race in the early hours of Saturday morning. A clutch of 52-ft boats are enjoying an intriguing battle some 100-nm behindRagamuffin 90. TP52 Freefire (HKG) is currently second on the water followed closely by Neil Pryde’s Welbourne 52 Hi Fi (HKG) and Brian Ehrhart’s Lucky (USA), another TP52. The third TP52 - Ernesto Echauz’sStandard Insurance Centennial, the only Philippines entry - opted for a different tactical approach, sailing much further south of the rhumb line, a strategic manoeuvre yet to pay off. Geoff Hill’s 72-ft Antipodes (GBR) is fifth on the water. The 34-strong fleet also includes Seawolf, whose crew is entirely composed of sailors from mainland China, a first for the race. Seawolf lies 24th on the water, some 327-nm from the finish. Gustavia’s Quai General de Gaulle was abuzz with Les Voiles de St. Barth competitors this morning as they fortified themselves with croissants and café au lait while checking the official notice board for the day’s race courses. With the nine classes separated into four starts, the fleet was sent off in a light southeasterly breeze of about 8 -10 knots, sailing courses of either 21 nautical miles or, in the case of the bigger, faster boats, 28 nautical miles. The light breeze made for a long day for most, though no one was complaining given the otherwise ideal conditions. With the breeze forecast to build throughout the week, all boats will have a chance to revel in their best conditions. In today’s racing, the Maxis had the closest finish, with Caol Ila R correcting out two minutes ahead of Bella Mente to win the Maxi division. Swiss sailor Franck Noel led his crew on Near Miss to a win in Spinnaker Zero; pre-race favorite Sergio Sagromoso’s Puerto Rican team, Lazy Dog, won Spinnaker One; Jack Desmond, back at Les Voiles this year on his Swan 48 Affinity, won Spinnaker Two; and in Multihulls, the smallest in the class, a Seacart 26 named Team All Stars, managed to best the bigger boats. Maxis Mix it UpSeven boats make up the Maxi division and range from the Mills 69, Mini Maxi Caol Ila R, owned/helmed by Swiss sailor Alex Schaerer, to the Swan 112 Highland Breeze, under the command of Dutchman Ben Kolf. 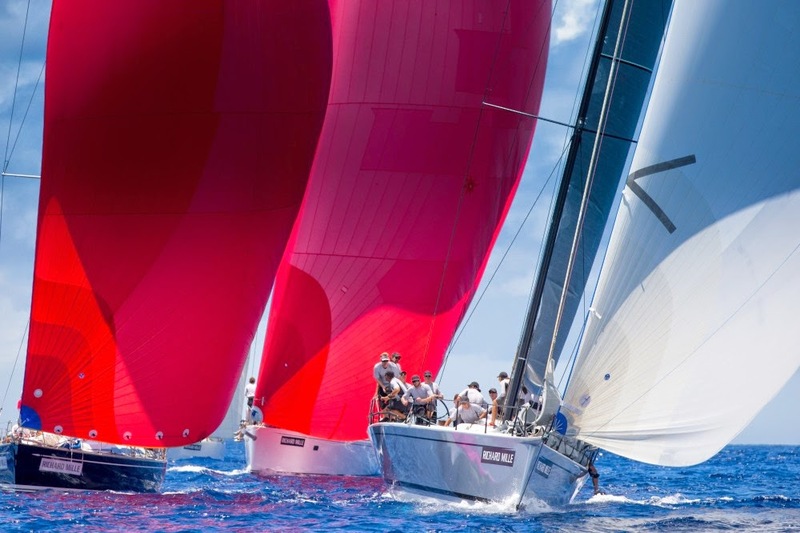 CaoI Ila R (ex-Allegra) has competed over the last two years in several of the top regattas in the Mediterranean, including the Rolex Capri Sailing Week Volcano Race, which it won in 2013. 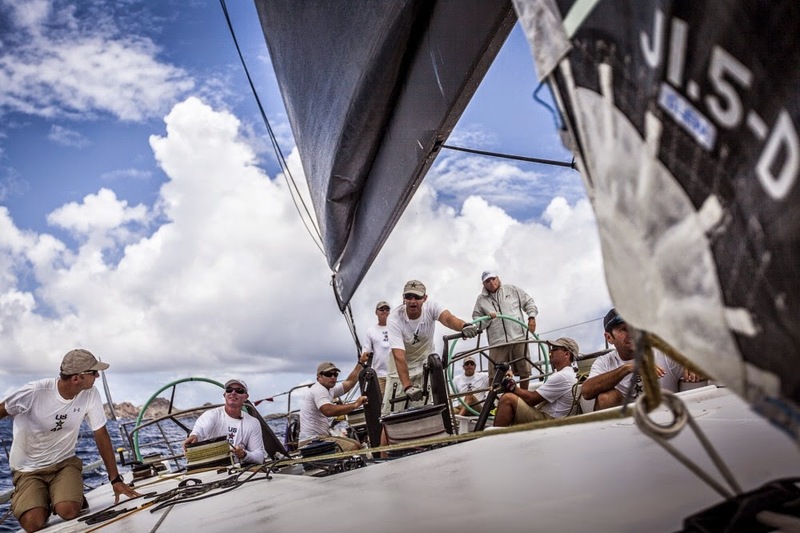 For this year, the boat’s U.S. program included Key West Race Week and Les Voiles de St. Barth, and Schaerer recruited a formidable, mostly Australian crew, many of whom come from the ultra-successful supermaxi Wild Oats XI. 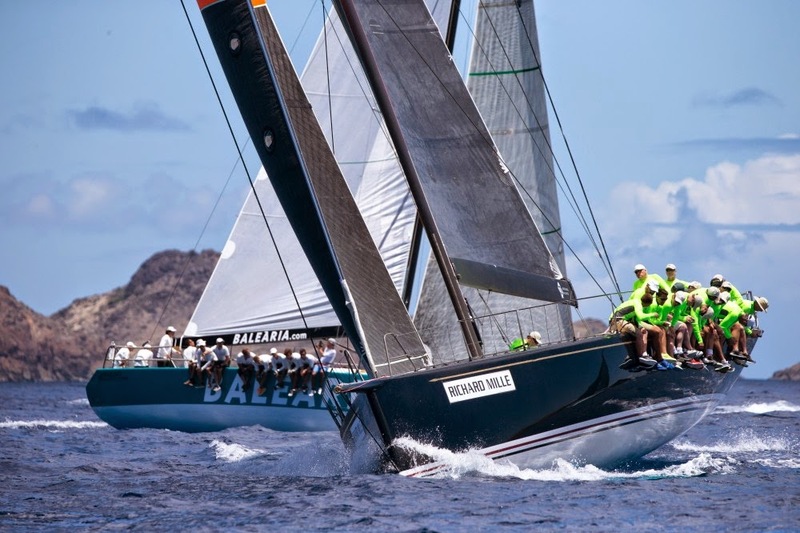 Meanwhile Bella Mente’s owner Hap Fauth (Minneapolis, Minn./Naples, Fla.),comes to St. Barth with his own seasoned team, which includes America’s Cup, Volvo Ocean Race and grand-prix race veterans – a blend of offshore and ‘round-the-buoy sailors that is fairly common now among professional sailors. Fauth, who helms his boat, is joined in the afterguard by Mike Sanderson (NZL), Terry Hutchinson (Annapolis, Maryland), and John Cutler (NZL). Fresh off a victory at the Caribbean 600, where Bella Mente took line honors and won CSA overall, the boat is racing at Les Voiles for the first time. 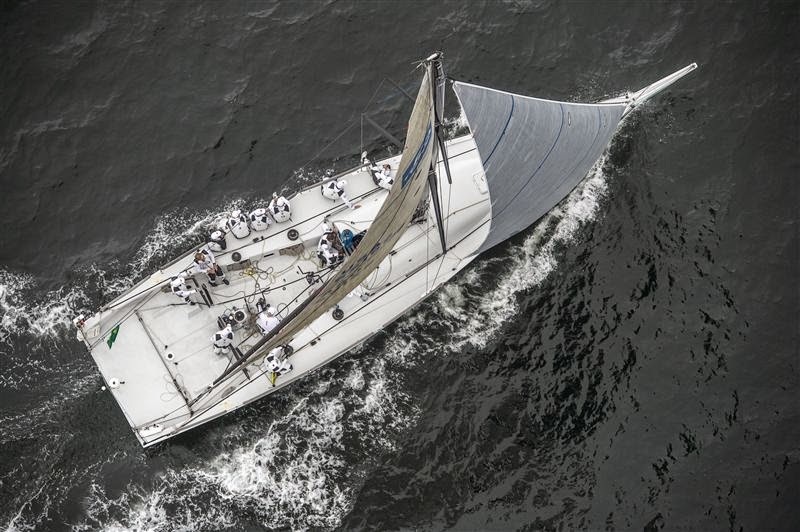 Also competing in the Maxi class is George David’s 90-foot Rambler, at Les Voiles for the third time. Rambler is stacked with a solid team, including the new wave of ‘younger’ sailors such as Rome Kirby, enjoying a semi-busman’s holiday in the tropics after being an integral part of the winning Oracle Team USA at the 34th America’s Cup, and Jesse Fielding, who has sailed many impressive miles since his starring role in Roy Disney’sMorning Light campaign (and movie of the same name). Rambler has scorched the race course here before and will be one of the Maxis to watch. “Looking at the scratch sheet, George David’s Rambler will be quite good and quite difficult beat,” Hutchinson continued. “And there is Caol Ila R that we also race against in the Mini Maxis. It is one of those teams that sits right behind you, and the boat’s fast enough that it can nip at your heels and never seem to go away. So I suspect those are our two biggest competitors. Manu Le Borgne, St. Barth Sail Racing, is a low-key French sailor who has made a name for himself through numerous Tour de France à la Voile campaigns in the late ’90s, before successfully joining the 60-foot ORMA trimaran circuit. He notably won the 2007 doublehanded Transat Jacques Vabre alongside French sailing legend Michel Desjoyeaux, two-time winner of the Vendée Globe Race. Le Borgne was also part of the historic Maxi trimaran Banque Populaire V when she smashed the Transatlantic race record in just three days and 19 hours. He is sailing in Les Voiles with friends from his home town of Brest, France, onboard a chartered A 40. Le Borgne said: "We'll try to keep things simple on the water. We’re here to have a good time, and that means giving it our all when on the water…what happens next, once we set foot in the village, is also part of the St. Barth philosophy. But we're all competitors and whenever there's a starting line to cross, we all give our best to achieve the best result possible." Racing continues tomorrow, Wednesday, Friday and Saturday (all 10 a.m. starts) for the nine classes: Maxi, IRC52, Spinnaker 1-2-3-4, Melges 24, Non-Spinnaker, and Racing Multihull. On Thursday, the now traditional lay day on St. Jean Bay, competitors will enjoy lunch at Nikki Beach as well as festivities that will include stand-up paddle board racing.